A dime or a quarter at a drive-thru may not seem like much, but when millions give, a huge difference can be made for children and families worldwide. The RMHC Donation Boxes are one of our biggest ongoing fundraisers. In 2015, alone, the Huntington Ronald McDonald House received over $130,000 from donation boxes. Did you know? 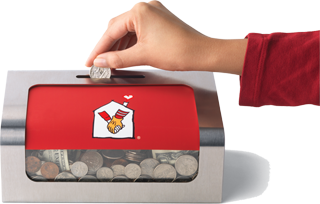 If every McDonald’s customer donated just a penny in the Donation Box, it could raise over $210 million to support children in need and their families. The next time you go to McDonald’s, please show your support for our mission and donate your spare change.